If you follow me on Instagram (@FrancescaPenko) you might recognize my outfit. I wore this to my cousin's beautiful wedding last weekend; my inspiration came from my Summer Wedding look-book I put together for this blog post. I opted for a bright, chevron skirt and kept the rest of my look neutral. This outfit was the perfect burst of color and comfortable enough to dance the whole night! Thank you SO much to everyone who watched my YouTube video and left all the positive feedback. It was something I was super nervous to upload and share, so I was blown away by the amazing response. I appreciate each and every comment- looking forward to uploading my next video! 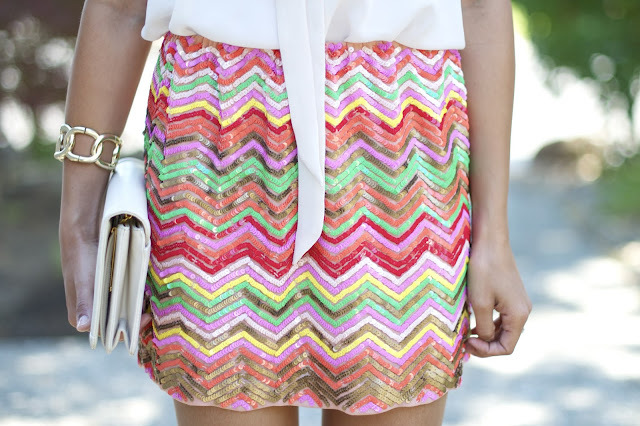 Love the bright colored chevron mini! The complete outfit is gorgeous!! I love that skirt so much! You look gorgeous! This is fantastic! You should do a post on your techniques for finding such great pieces. I never have the patience in thrift stores but every post and outfit you create seriously is amazing. Love your blog! I love your skirt! I know it's from marshalls but what brand is it?